Pediatric pulmonary abscess is a rare respiratory problem in childhood. The incidence of lung abscess in children is 0.7 per 100,000 admissions per year. Advances in the field of antibiotics have drastically reduced the incidence of lung abscesses that too in children. We are reporting a 18 month-old baby with lung abscess and is probably one of the few cases reported in the literature in the modern antibiotic era. 18 month-old baby developmentally normal girl was presented with history of cough, fever, and respiratory distress for the past 7 days. On examination, she was 8 kg, febrile (103°F), and respiratory rate 66/min with respiratory distress. Auscultation revealed bronchial breath sounds in the right mammary, infraaxillary, and right interscapular areas. Rest of the examination was normal. Investigations revealed the following: hemoglobin 8.5 gm/dl, total leucocyte count 17500/mm 3 , platelet count 3.6 lakhs/mm 3 , HIV negative, and kidney function tests were normal. Blood and urine cultures were sterile. The chest radiograph demonstrated a large well-circumscribed consolidated lesion of the right upper lobe with an air fluid level [Figure 1]. Computed tomography scan of the chest confirmed the presence of 45-mm-thick walled cavitatory lesion with air fluid level in the right upper lobe with surrounding normal lung tissues consistent with an abscess [Figure 1]. She was treated with intravenous ceftriaxone, linezolid, and amikacin for 2 weeks followed by oral amoxy clavulanic acid for 3 weeks. She became afebrile within 6 days of antibiotics and remained so for the rest of her hospital stay. 1. Tan TQ, Seilheimer DK. Pediatric lung abscess: Clinical management and outcome. Pediatr Infect Dis J 1995;14:51-5. 2. Mishra R, Mishra T, Ratan K, Abrol P, Kadian Y. Right upper lobe lung abscess in an infant. Internet J Surg 2009;20:1. 3. Patradoon-Ho P, Fitzgerald DA. Lung abscess in children. Paediatr Respir Rev 2007;8:77-84. 4. Yen CC, Tang RB, Chen SJ, Chin TW. 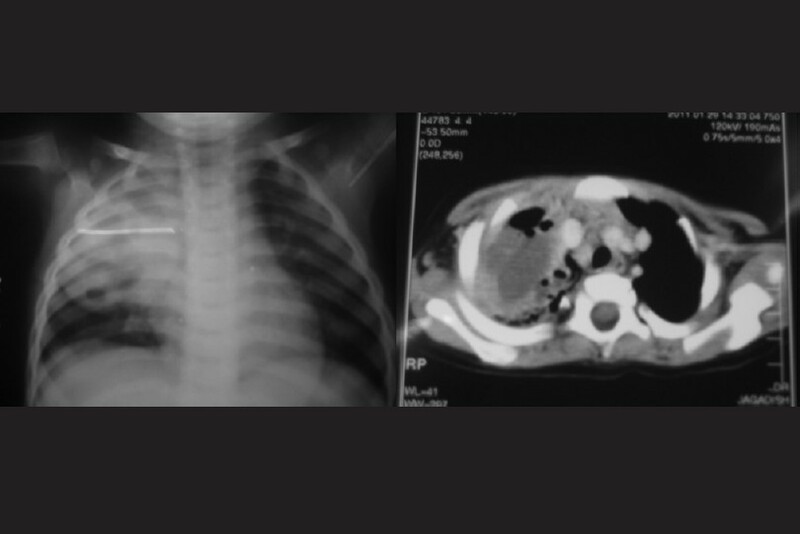 Pediatric lung abscess: A retrospective review of 23 cases. J Microbiol Immunol Infect 2004;37:45-9. 5. Chan PC, Huang LM, Wu PS, Chang PY, Yang TT, Lu CY, et al. Clinical management and outcome of childhood lung abscess: A 16-year experience. J Microbiol Immunol Infect 2005;38:183-8. 6. Emanuel BA, Shulman ST. Lung abscess in infants and children. Clin Pediatr (Phila) 1995;34:2-6.